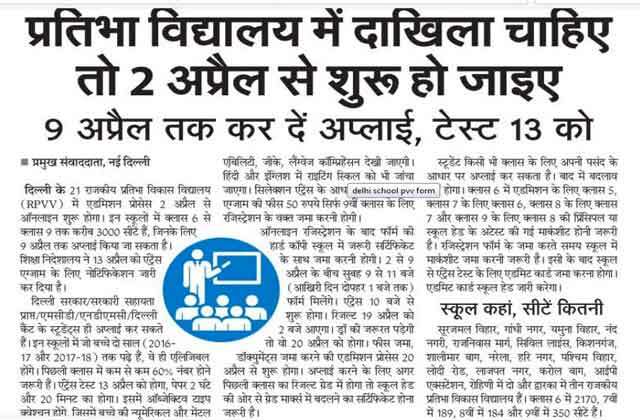 Delhi Government has issued a notification for admissions of students for Government / Government Aided / MCD / NDMC / Delhi Cantonment Board Schools in Class 6, Class 7, Class 8 and Class 9 in the 21 Rajkiya Pratibha Vikas Vidyalayas for the academic session 2018-19. Here are the detailed instructions on How to apply online for admission in Rajkiya Pratibha Vikas Vidyalaya 2018-19. As per the official notification, there are around 3000 vacant seats, for which admission process will begin from 2nd of April, 2018. The last date to apply online is April 9, 2018. The final list of vacant seats in a school can be obtained from the respective Rajkiya Pratibha Vikas Vidyalaya. Candidate must have studied for at least two years in RPVV located in Delhi in the academic year 2016-17 & 2017-18. Candidate must have obtained at least 60% marks in the last class. As per the admission notice, Applicants/Parents have to contact the respective HOS of the school where the student is presently studying for registration for Entrance Test for admission in Rajkiya Pratibha Vikas Vidyalaya. The HOS of government/government aided schools of DOE, NDMC and Delhi Cantonment board will register online the eligible students of their respective schools for entrance test for admission in RPVV and will hand over the hard copy of registration form along with the requisite certificates to the parent of the student who will submit the registration form with requisite documents to HOS of concerned RPVV in which the student has been registered for Entrance Test for admission. Registration will be done online by HOS of government/government aided schools related to DoE NDMC and Delhi Cantonment Board. However, in case of new Rajkiya Pratibha Vikas Vidyalaya, Sector-5, Dwarka, the registration form may be submitted in Rajkiya Pratibha Vikas Vidyalaya, Sector-10, Dwarka. If you have any query/suggestion, please write it down in the comment box. We will get back to you ASAP. Press CTRL+D button to bookmark this page. How to apply for first classs. please advice me.